This is a Drawing. It was made for Lefebvre Manufactory, Tournai. We acquired it in 1931. Its medium is brush and watercolor, pen and black ink, on cream laid paper. It is a part of the Drawings, Prints, and Graphic Design department. 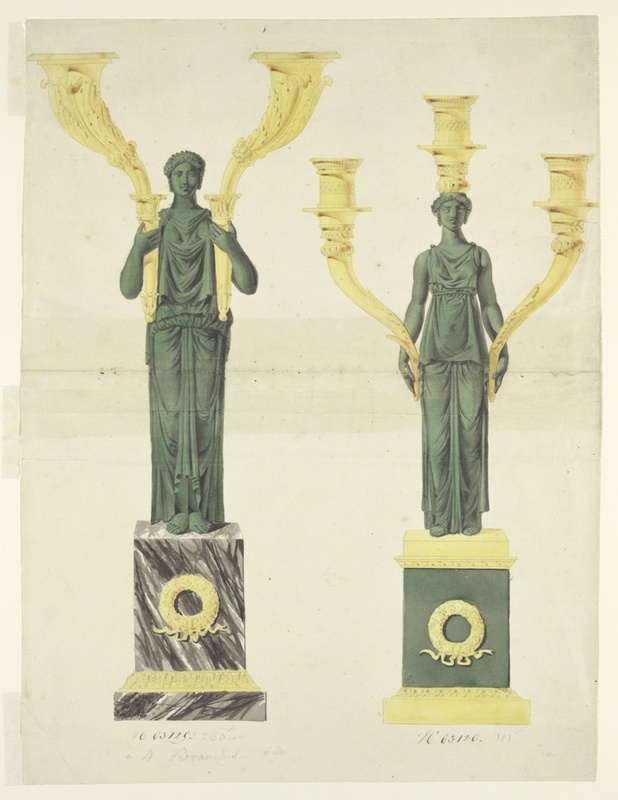 Although created away from the stylistic center of Paris, this design from Belgium is very close to the large candelabra seen nearby, featuring both patinated and gilt bronze classical female figures. The Lefebvre Manufactory of gilt and engraved bronze was highly regarded throughout Europe. This object was donated by Eleanor Garnier Hewitt and catalogued by Julia Siemon.